Electrochemical Sensor Equivalents for all well known makes. Russell Mainstream Supply Limited offer electrochemical sensor equivalents to all well known manufacturers of pH, Reference, Conductivity, Dissolved Oxygen, Redox (ORP) and Ion Selective electrodes. Our sensors have many technical benefits over our competitors and offer greater accuracy, stability and extended working life - at competitive prices!! Please click on one of the list of manufacturers below to view our equivalents - please note manufacturer part number on left hand side and R.M.S on the right. Once you have determined our equivalent number, please contact us quoting this number and one of our sales team will give you our best possible prices and delivery!! 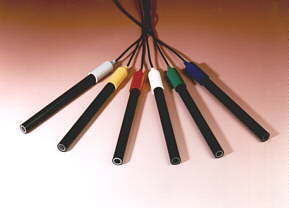 The probes listed are the R.M.S equivalents to the ones offered by the suppliers. If the appearance is not exactly the same, the performance will be equal or better. Please Note: 4 band conductivity for Denver meters are not available. Conductivity and DO2 probe alternatives are available on request. IF YOU CANNOT SEE A PROBE YOU ARE LOOKING FOR - PLEASE ASK US.